We arrived in Krabi after another 12 hour bus ride from Bangkok, but luckily thanks to a lot of space on the bus and our last sleeping tablets we both slept nearly 3/4 of the way. 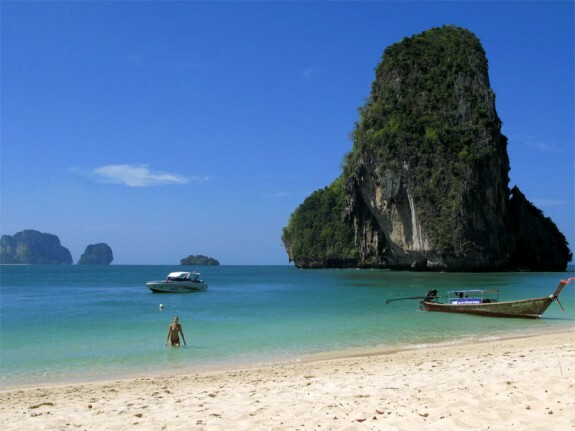 We decided to head to the beach resort of Ao Nang, so we got a taxi from Krabi town which is only 20 minutes away. We managed to get a nice room quite quickly and then we were so starving we had to have breakfast. The weather was good, so we headed out to the beach after buying a straw mate made literally out of drinking straws. The beach was fairly quiet and had a lovely setting with a limestone cliff, hemming in the south end of the beach and a national park at the north. We chilled out under the shade or most of the day. In the evening we had dinner at a local food market, however this area is more for families and holiday makers and one of the most expensive areas we have been to in Thailand. The following day the weather was also really nice so after a healthy muesli breakfast we headed back out to the beach and our shady area under the tree. After about 2 hours the sky darkened and we could see the rain headed towards the beach from the small islands just off the shore. The rain lasted all afternoon and most of the evening. As it was raining we had a nice lunch and then went to one of the top hotels which was offering discounts on massage and beauty treatments. Wayne had an hour back neck and shoulder massage and I had a pedicure and foot scrub. The treatments were in fact 1/2 price at it was still the low season so I think we ended up paying about £4 between us. On our 3rd day we decided to leave Ao Nany for Railay, a small peninsular just a 10 minute ride from Ao Nang beach. Railay beach is a limestone cliff and the only way to get to the beach and resort it by longtail boat, so it was secluded although fairly busy. We found a nice bungalow set up on the hillside and it only cost £3.50 per night. Railay had 3 beaches the East which is not suitable for swimming as it is full of mangroves, this area is also dirty. The West beach had nice golden sand and has the upmarket resorts lining the bay. Phranang Cave Beach is tucked away behind an exclusive resort, however the beach itself is open to the public. The beach here is fine white sand and very wide, the nicest and most picturesque! As Railay beach is surrounded by caves and cliffs, the main sport here is rock climbing. We saw lots of groups of climbers and lots of chalk on the rocks where they had been climbing. Some experienced climbers were just free climbing with no ropes, mad as the cliffs were sheer. We spent 2 days here and it was really nice, the restaurant at our bungalows served a good meal and on our last night managed to watch the England game. We stayed out to watch the England rugby semi, but only managed to watch the first 1/2 as we had been drinking for 5 hours and it finally took its toll. Krabi is a nice area but as it was the end of the monsoon season we had rain most afternoons which was a bit of a shame as we could not enjoy the lovely scenery as well as we could of if the rain had held off.